Your favorite instructors are available throughout the season for one-on-one instruction. Beginner to advanced students welcome. Open to everyone. Packages available. Email us at info@cwwcollective.com for more details. Your favorite instructors are available throughout the season for small group or one-on-one instruction on the American River drainage. Beginner to advanced girls & boys ages 7 & up welcome. Packages available. CWWC has teamed up with Sundance Kayak School and their home river, the beautiful Rogue, for this multi-level kayaking clinic! This is a holistic paddling workshop, specifically designed for women interested in learning to kayak, refining skills or taking it to the next level. During the day, your instructors will teach you the paddling skills required to successfully read and navigate rapids. Each night you’ll stay at a beautiful rustic campground, on the banks of the Rogue River in Oregon – far away from the hustle and bustle. Each afternoon, when we return from kayaking, you will have the option of participating in a variety of on-land activities – including river safety, nutrition, yoga and more! We even have a massage therapist on-site to unwind and relax in the evening. The Rogue River has lots of different sections to choose from rated class I-IV. Each day we will run a different section of the Rogue River, depending on your goals and skill level. If you have never kayaked before, you will start by being introduced to whitewater kayaks and paddling gear. You’ll discover you can easily get out of the boat and we’ll learn a few basic strokes to put you in control. If you are already paddling and are looking to refine your paddling technique and improve your confidence on the river, you will begin with a kayaking skills assessment and together we’ll identify areas for improvement. Then we’ll head to the section of river that’s right for you! Rogue river trips are offered through Sundance Kayak School, an authorized BLM Special Recreation Permit holder. Are you interested in whitewater kayaking? Or have you taken a class before but want a refresher to help you get back on the water? This beginner 2-day clinic on the South Fork American will introduce or re-introduce you to the joys of being a whitewater kayaker in a safe and supportive environment. Each day will be spent learning paddling skills on the water and the evening with on-land workshops, a restorative yoga class to maintain body alignment and a potluck dinner. We will cover river equipment, paddling skills, basic river hydrology, safety and so much more! There is even a massage therapist on-site to soothe those aching muscles. In the morning, we’ll practice yoga, pack up camp and hit the water for more instruction! Introduction to Whitewater – We’ll cover balance and control of the kayak, self-rescue and safety fundamentals while learning to navigate rapids up to Class 2. We progress at a safe pace to ensure you have a great time learning on the river and want to come back for more! Beginning Whitewater - You'll be re-acquainted with being in a river kayak. We'll go over the basics, including the essential paddle strokes needed to effectively maneuver your kayak, basic hydrology and reading the water. Progressing up to Class 2 rapids, we'll give you the tools to have fun and feel excited about being back on the water! Join CWWC as we team up with Barker River Trips for four days of Pilates and kayak instruction on the iconic Salmon River! Lead by World Champion kayaker, Devon Barker-Hicks and Pilates Instructor and Wellness Coach, Lisa Marie, on a fun filled wilderness Wellness Retreat. By combining the beauty of the river and the movement of Pilates this retreat offers not just an adventure but an awareness of how the river moves similar to our movements. Kayaker, Lisa Marie has been teaching Pilates for over 10 years and offers a stretch/exercise repertoire called Pilates for Paddlers which will be integrated into each day of the retreat. All meals will be skillfully prepared by your guides on the banks of the river and are included in this retreat. The lower Salmon River gorge offers a variety of experiences for the float boater. From Hammer Creek to its confluence with the Snake River (53 miles) the river falls an average of 10 feet per mile. It is a pool and drop river, offering stretches of quiet water punctuated with the roar of whitewater rapids. The canyon terrain is as varied as the river itself. The river flows through four distinct canyons: Green, Cougar, Snowhole, and Blue Canyons. In these canyons, the walls are precipitous and rocky, and the river is narrow and fast. Between the canyons the river is broader and slower, and the terrain is more open with rolling grassy slopes and rock outcroppings. There is evidence of human presence, including occasional roads and ranches. The Salmon from Hammer Creek to its confluence with the Snake has been introduced in Congress for inclusion in the National Wild and Scenic River system. On this stretch of river are 21 class III rapids and two class IV rapids. This is a lot of whitewater for the miles covered. This unique retreat is open to women of all ability levels, even if you’ve never sat in a boat! Depending on preference and skill level, there are options to paddle a hardshell (whitewater) kayak, inflatable kayak or just enjoy the scenery in a guided raft. So it’s the perfect trip if you’re already a paddler and want to bring a non-kayaker friend who may be interested in getting into this amazing sport. In association with Barker River Trips. CWWC is partnering with Anna Levesque of Mind Body Paddle (Girls at Play), Laura Fallon and Canyons River Company for an unforgettable women’s kayaking, rafting and yoga wilderness trip on the remote Main Salmon River in Idaho! This 80+ mile, 6-day journey rejuvenates your body, spirit and mind by connecting you with the flow of the river, the peacefulness of nature, the laughter of friends, awesome whitewater adventure and yoga. The Main is big western class III/IV water at its best: It’s so wide that we can choose between a wild ride down one side or a more conservative line on the other. Beautiful, big sandy beaches make for easy camping and inspiring yoga. Moose, black bear, bighorn sheep, and golden eagle are often spotted in the canyon. Did we mention that you get to soak in hot springs too?! You’ll also see the occasional jet boat that supplies the historical ranches along the river with mail, food, and other necessities. Canyons River Company has been operating on the beautiful Salmon Challis National Forest for over 25 years and they know how to run awesome trips, including amazing food, beverages and comfort camping! Their experience combined with CWWC and Girls at Play’s attention to confidence building, camaraderie, transformation, empowerment and (most importantly) fun make this a trip of a lifetime. So don’t miss out on this unique opportunity to paddle an amazing river with amazing women! This trip is open to ALL SKILL LEVELS! There is no paddling skill level required for this trip if you want to paddle an inflatable kayak or in a guided raft. It’s a great trip for women who want to experience a wilderness river trip. If your intention is to whitewater kayak the entire river then we request that you be experienced in class III and have a successful whitewater roll 70% of the time. Cost of the trip includes: Kayak instruction/guiding with CWWC and Girls at Play staff, daily yoga class, professional guiding, gourmet meals, beverages, tents, dry bags, wet suits, river equipment, and, for experienced paddlers, the use of our canoes and kayaks. Come celebrate our river and community with Cali Collective! Kayaking and rafting on our beautiful South Fork American River followed by music, food, camping & fun! 3:00 pm - Campground opens. Games for kids and grownups. Yummy food & icy cold refreshments available. 5:00 pm - Live Music by Boot Juice Jams! 8:00 pm - Costume contest, raffle winners announced & prizes awarded! EVERYONE is welcome to this all-ages event!!! Join us for a 10-day ALL INCLUSIVE adventure in breathtaking Patagonia, Chile! This unique and active trip includes kayaking beautiful rivers and so much more! You'll learn firsthand about the indigenous Chilean peoples - spending afternoons with local Mapuche communities and sharing meals with them. 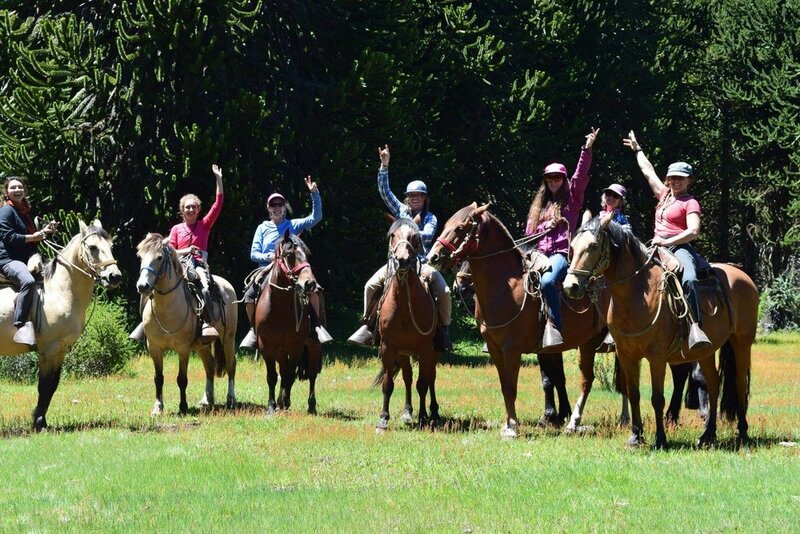 We'll take you on a horse trek into the mountains to a refreshing lake and enjoy a traditional Chilean BBQ lunch. We'll hike through an ancient forest, with 2000+ year old Araucania trees and peer at at the Argentinian border. Our rest day involves soaking in soothing pristine hot springs, yoga and massage. Accommodations are in a comfortable guesthouse in the beautiful Puesco Valley and we’ll be enjoying delicious farm-to-table meals each day. Soak in the local culture. Sip Chilean wines. Paddle down crystal clear turquoise blue waters. Shop at artisan markets. Laugh. Dance. Relax. Enjoy your well-earned time off! Our hope is to make you love Chile as much as we do! Cost includes lodging, meals, kayaking & excursions, transportation to all activities and paddling gear (airfare not included). Beginner to Class 4 options available. In association with <Escape> Patagonia. $500 non-refundable deposit is required to register. Payment plans available. Have questions? Email us at info@cwwcollective.com for more information. Check out the full album from our 2016 trip on our Facebook page! Are you interested in whitewater kayaking? Or have you taken a class before but want a refresher to help you get back on the water? This 2-day clinic on the South Fork American will introduce or re-introduce you to the joys of being a whitewater kayaker in a safe and supportive environment. Each day will be spent learning paddling skills on the water and the evening with on-land workshops, a restorative yoga class to maintain body alignment and a potluck dinner. We will cover river equipment, paddling skills, basic river hydrology, safety and so much more! There is even a massage therapist on-site to soothe those aching muscles. In the morning, we’ll practice yoga, pack up camp and hit the water for more instruction! This clinic is sold out. Please stayed tuned for future events. Please contact us at info@cwwcollective.com if you are interested in private one-on-one or group instruction. This is a multi-level class on the South Fork American! Whether are a beginner or are an experienced paddler – this is the weekend for you! For the on-water instruction, the class is divided into 3 groups – Class 2, Class 2/3 and Class 3 & Beyond. In the afternoon, the class reunites for on-land workshops, a restorative yoga class to maintain body alignment and a potluck dinner. There is even a massage therapist on-site to soothe those aching muscles ($1 per minute). In the morning, we’ll practice yoga, pack up camp and hit the water for more instruction! Class 2/3 - This level group will spend day 1 on the C-G section, making Class 3 moves in Class 2. We'll explore surfing, catching more challenging eddies and the all important - combat roll. Day 2 will be spent on the Class 3 Chili Bar section where you'll put your solid skills to the test. Class 3 & Beyond – The goal in this class is strengthen your existing skills and teach you some new ones to make kayaking more fun and dynamic. We will be covering such skills as jet ferries, surfing, attainments, the combat roll, making Class 4 moves in Class 3 and how to make good decisions on the river. This group will be on the Chili Bar section both days. The cost of the clinic includes instruction both days, camping and yoga. Please note: The cost of the clinic doe not include kayak and gear. We can demo you the “Big 5” – kayak, paddle, personal flotation device (PFD), sprayskirt and helmet. This gear will be there ready for you when you check in to this clinic. This clinic is sold out. Please stay tuned for future events! Are you looking to progress your paddling while making the river even more fun? Then this IS the class for you! This 1-day clinic teaches you the fundamentals of the stern squirt, rock splat and surfing waves - making you more comfortable in your boat and giving you more control in whitewater. Why are these moves important? They force you to be aware of your edges, how to isolate movements with your lower and upper body and ultimately expand your options when running rapids. By learning and practicing these skills, you'll become relaxed enough to drop whichever edge you like while staying on top of the boat and more comfortable when the boat is vertical -- turning you into a ninja when it comes to correcting unintentional surfs and back-enders while river running. And they are just straight up fun! This clinic is for intermediate to advanced paddlers. We will be playing and rolling (a lot) down the Class 3 "Gorge" section of the South Fork American. To participate, you must be comfortable in Class 3 and have a consistent combat roll. Additionally, to make the most out of this clinic, we recommend a low-volume, "slicey" boat or playboat. If you have questions about which boats are appropriate or if this clinic is for you -- please email us at info@cwwcollective.com. Are you interested in whitewater kayaking? Or have you taken a class before but want a refresher to help you get back on the water? 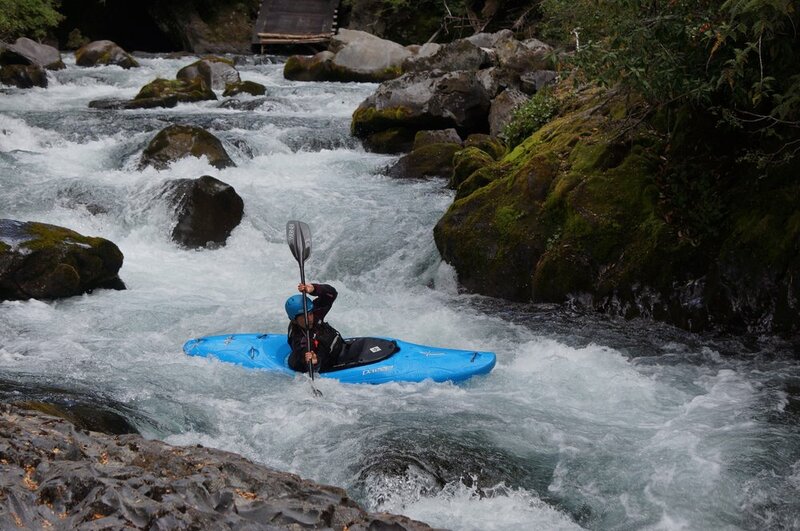 This beginner 2-day clinic on the South Fork American will introduce or re-introduce you to the joys of being a whitewater kayaker in a safe and supportive environment. Each day will be spent learning paddling skills on the water and the evening with on-land workshops, a restorative yoga class to maintain body alignment and a potluck dinner. We will cover river equipment, paddling skills, basic river hydrology, safety and so much more! There is even a massage therapist on-site to soothe those aching muscles ($1 per minute). In the morning, we’ll practice yoga, pack up camp and hit the water for more instruction! The Rogue River has lots of different sections to choose from rated class I-III. Each day we will run a different section of the Rogue River, depending on your goals and skill level. If you have never kayaked before, you will start by being introduced to whitewater kayaks and paddling gear. You’ll discover you can easily get out of the boat and we’ll learn a few basic strokes to put you in control. If you are already paddling and are looking to refine your paddling technique and improve your confidence on the river, you will begin with a kayaking skills assessment and together we’ll identify areas for improvement. Then we’ll head to the section of river that’s right for you! In association with Sundance Kayak School.